Give him the experience of indulgence and lathering up with a quality shave cream & brush, for a traditionally masculine shave. Wet shaving not only provides the closest shave possible, but makes shaving and grooming enjoyable. The genuine badger hair brush helps achieve optimal shaving results while relieving & preventing ingrown hairs & razor irritation. A richer lather is achieved with the use of this quality shaving brush and the more thorough the lathering process, the better the shave. 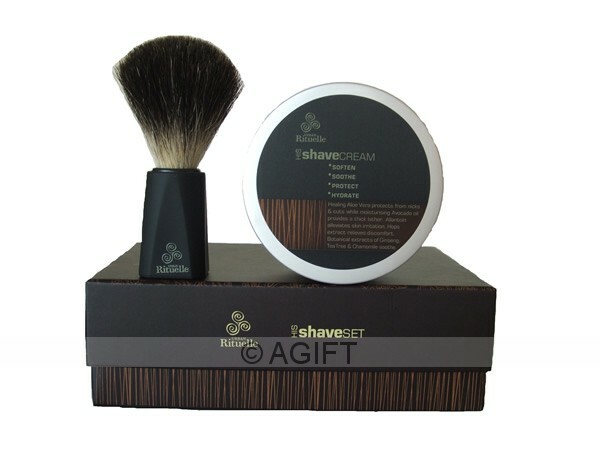 His Shave Set is stylishly presented in a box set and is an ideal gift solution for that hard to buy for man.